With a history stretching back 122 years to its formation in 1894, Duns Golf Club offers its visitors a 21st century golfing experience. Widely admired for the outstanding quality of its golf course, the club is also known for the relaxed and sociable atmosphere of its clubhouse. A wonderful setting amongst the Cheviot Hills in the Tweed Valley, Duns is obviously a very mature course. 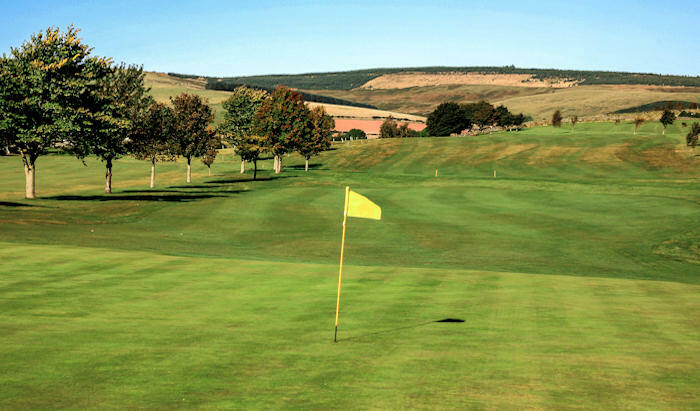 The course was designed sympathetically to blend in with the spectacular rolling landscape of the Scottish Borders and gently contours with excellent true running greens. It’s not too demanding in terms of gradient or length. There are tree-lined fairways, long and short par 3s – five in total – which test every facet of your golf game. The clubhouse lounge is bright and relaxed, overlooking the 18th green. There is a bar and a pleasant, sunny restaurant. The club has modern changing facilities and well-maintained practice grounds. The par 3, 15th hole has a big two tier green and a burn running at the front. Keep your nerve and hit the right tier and you’ll walk off with a birdie! Hot Roll and Tea/Coffee for £3. 2 Course Meal for £10. Hire a Buggy for £20. Bring a Friend for £20.